Eagle Ridge Townhomes in Breckenridge CO Real Estate are located in Warriors Mark on the south end of Breckenridge, Colorado. This is a very small Breckenridge townhome complex with 6 properties. Built in 1981 there are 5 – 3 bedroom townhomes and 1 – 4 bedroom townhome. Each Eagle Ridge Townhome is 2,334 square feet on three levels although the third level is a loft. These Breckenridge townhomes each have a 2-car garage that is attached to the property. With two spacious living room spaces and an oversize deck with mountain views gives plenty of space for larger families or to entertain. These Breckenridge townhomes are a short walk or bus ride from the Victorian Breckenridge Main Street for shopping, dining and year round events. 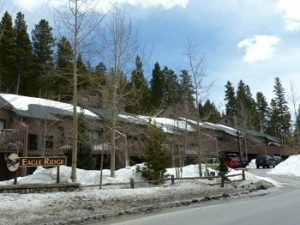 Eagle Ridge Townhomes are also a short walk to the base of Peak 9 of the Breckenridge Ski Area or out your front door is a bus stop to take you to the slopes or Gondola. Across the street is town open space which borders the serene Blue River. The in-town location of Eagle Ridge Townhomes is hard to beat when looking at Summit County Real Estate. Eagle Ridge Townhome hoa dues are $260 per month and include snow removal, trash pick-up, sewer and common area maintenance which takes care of the exterior of the building. Arrange a showing of Eagle Ridge Townhomes in Breckenridge CO Real Estate if you are looking for larger space, close to town with low dues.